Seeing that Buddhism was born out of a Hindu culture, there are many similarities between Hinduism and Buddhism. Buddhism retained the Hindu concepts of Samsara, reincarnation, karma, dharma and nirvana. They believe that everyone progresses through the universe based on the karma that they accumulate and then with proper teachings (dharma) and actions they can escape the process of Samsara and reach Nirvana. work your way up the castes in seperate lives in order to reach Nirvana, anyone can. to keep their lives free of meaningless ritual. absolute answer until you reach enlightenment. Such debates are pointless. know. Knowledge should be available to all people, not just a certain class. meant that anyone could escape samsara, and not just move up the ladder after a good life. things which have helped others to reach enlightenment and end samsara. anyway and everyone will have been reincarnated as a man or a woman at one time anyway. - Violence is not tolerated towards any living thing. Anicca - the state of impermanence. Everything is constantly changing. one time or another in life. True happiness is a fleeting thing. all people are more than just the sum of their parts. Siddhartha discovered. This is also called the Nobel Eightfold Path. 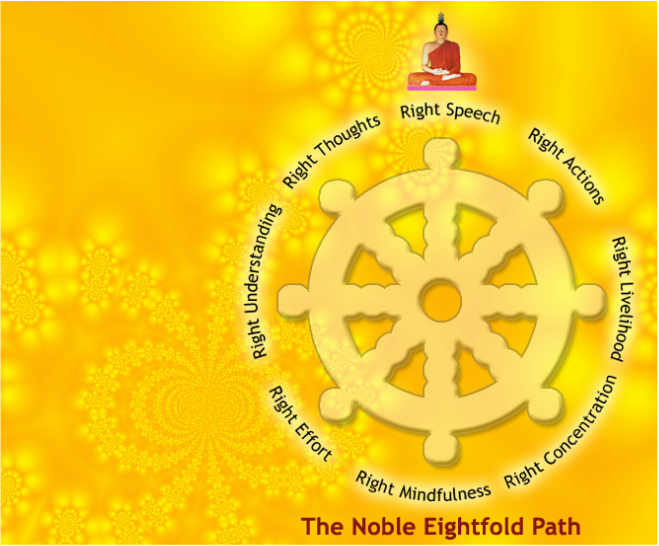 Create your own version of the wheel of Buddhism demonstrating the Eight Nobel Truths of the Middle Path. Write a description of each of the truths that make the points on the wheel. The final assignment in the Buddhism section will cover some of the changes that Buddhism has gone through since the time of Buddha Siddhartha as the philosophy has spread throughout Eastern Asia and across the world.